Physical Yoga Therapy treats the whole person to assist clients in tapping into their own unique capacity for healing. It draws upon clinical knowledge of physical therapy, yoga postures, meditation, and breath to improve self-awareness in healing physically, emotionally, and spiritually. My name is Donna Chisholm. I am licensed Physical Therapist with over 25 years of clinical experience including acute care, home health, skilled nursing, college-level teaching, and in-patient and out-patient rehabilitation. 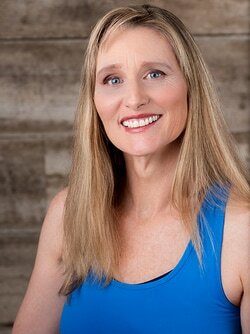 I have been practicing yoga for the past 25 years and am a Registered Yoga Teacher with an RYT-200 hr training certification. Physical Yoga Therapy is the most effective medium I have found to treating human beings seeking optimal health and mobility. Physical Yoga Therapy (PYT) stresses injury prevention and recovery from injury. Injuries result from incorrect alignment combined with imbalances of the musculoskeletal system. With my clinical knowledge of physical therapy, functional anatomy, and bio-mechanics, I provide proper alignment principles and individualized modifications. This eliminates risk of repetitive stress injuries, chronic pain, and the inability to do what you love to do. Yoga is meant to be a life-long health practice and the good news is that it's never too late to start! Just like physical therapy, yoga is safely practiced with experienced guidance where individualized modifications and adjustments can be made. Physical Yoga Therapy’s philosophy is to gently strengthen what is weak, stretch what is tight and create balance in order to maximize well-being. Repetitive stress injuries including sprains and strains that most commonly occur in wrist, elbow, shoulder, hip, knee or ankle. Examples include carpal tunnel, shoulder impingement, and hip or knee tendonitis. Are you new to yoga and would like to reduce your risk of injury when you attend yoga classes? ©Physical Yoga Therapy. All rights reserved. Login.